Popular vegetarian recipes - those requested and printed the most. Vegetarian recipes, those looked at, requested and printed the most. Very simple chilli recipe using Quorn as the meat substitute. 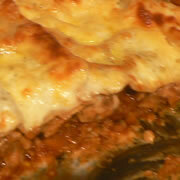 ..
A very good, and relatively simple vegetarian lasagna recipe using lentils. This is one recipe the kids will eat without a single moan. ..
Saag Aloo is a delicious spicy blend of spinach and chunky potatoes, and goes very well with parathas or naan. It is very easy and inexpensive to make, and will impress the h ..
A perfect vegetarian recipe for quorn mince. You'd never know you were not eating a traditional lasagne. ..
Every day vegetarian hot pot recipe that has been around for a few years. 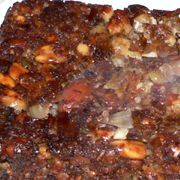 ..
A pretty good Nut Roast, considerably better than we have ever been able to find in the shops. Will need gravy or a sauce to accompany it. 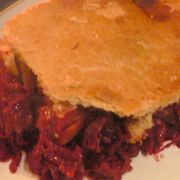 ..
A wholemeal pastry recipe, short crust either sweet or savoury, suitable for pie tops on a number of vegetarian dishes. ..
One of my favourite, if occaisional, recipes before going veggie was a decent stroganoff. This vegetarian stroganoff using quorn at the core, is a good alternative. .. This recipe is from Ainsley Harriott's book 'Gourmet Express 2'. When you come across one of those recipes that really tickles your taste buds, this is one of those. ..
A delicious, fast vegetarian chili thick enough to serve as a filling for burritos. ..
One of my childhood favourite dishes was potato hash, made by my mother, my grandmother and my great gran too. (Though my mums was best). Traditionally made with corned beef from the tin, potato hash is one of the childhood flavours and smells you c ..
Meat-free vegetarian Scotch eggs for those packed lunches, picnics, buffet parties and family salads. ..
Big portion recipe for a tasty vegetarian lasagne. You can scale this one down a little, but when you're serving for greater numbers this one fits the bill. ..
Low fat simple cake, perfect for those of us on a diet. 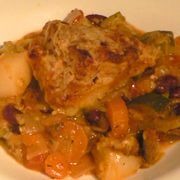 ..
Not quite my mums tata ash, but a very robust quorn casserole. The slower you cook it the fuller the flavour. .. This is a nice vegetarian short pastry for everyday pies. ..
An amazingly excellent recipe. We had a number of raw beetroot to use when we were getting organic vegetables delivered via the Riverford Organic Vegetable box scheme. Only ever having had pickled beetroot with salads and stews before, we went looki ..
Easy peasy clear vegetable soup. ..
A light clear soup that goes well with crusty chunks of bread and a quiet moment. .. I could eat take-away sweet and sour every day if I could afford it. And it is one of the few dishes that tempt my vegetarian choice. Few Chinese take-aways do a vegetable sweet and sour as good as their meat based sweet and sour dishes. 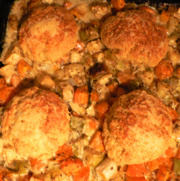 This quorn ..
A sort of savoury vegetable cobbler; this hot pot is topped with a simple scone mixture. The combination is taste-tastic. Use your favourite vegetables, as long as the overall weight remains the same. Some substituted vegetables may need a little lon ..
A delicate vegetarian rissole recipe, with the ever-versatile lentil at the heart of the dish. As with all pulses it does take some time to cook, so I often combine this with another long-winded dish to make the most of my time. .. I think this recipe was from the British Asparagus Growers Association. We tried it and like it! ..
An easy, straightforward vegetarian hot pot recipe. A decent main meal in its own right, and serves well with most vegetable dishes. We like it as is and have either with a good dollop of dark sauce, or with a little sliced pickled beetroot. And the ..
A super simple vegetarian broccoli casserole recipe ..
A family favourite made easy. Delicious Quorn Mince is so versatile... ..
A nice solid savoury pie recipe for vegetarians, something to base other vegetables around. ..
A nice potato main course for the odd occaision. ..
Classic white sauce - or bechamel - really is not as difficult to make as most people think. This white sauce is used in hundreds of recipes, and you can add an unlimited range of ingredients to make a different sauce; cheese, parsley, onion, etc. .. I have no idea why it is called 'Old Mans' Vegetable pie. Its what my granny called it, she used to make it from time in a big dish, if she had a few of us to feed, me and my cousins. I'm glad I got her to tell me the recipe now. ..